We believe that the Church exists to be the hands and feet of Christ to those around us who are physically, emotionally, and spiritually in need. Our local compassion ministry arm here at Boca Raton Community Church strives to live out the command Christ gave us in Matthew 25:31-45, always keeping in mind His words when He said, “Truly I tell you, whatever you did for one of the least of these brothers and sisters of mine, you did for me.” We base our ministry efforts in this area on the six actions laid out in these verses: provide food to the hungry, drink to the thirsty, a home to the homeless, clothes for those who have none, care for the sick, and to visit those who are in prison. See below for more information and to find out how you can get involved. We support our community through local compassion efforts throughout the year. Continue reading to hear how you can get involved. The vision of Heart2Heart Senior Outreach is to provide residents in South Florida long term care centers with regular and consistent visitation with the opportunity to experience the love of Jesus Christ through caring relationships. We hope you’ll consider being a part of this amazing ministry! Join us at our next training on Sunday, February 17 @12:00p in the Sanctuary Family Room. Lunch is provided. For many students from low-income families who qualify for free or reduced lunches at school, the meals provided on their campuses are the only ones they receive all week. Through our Boca Helping Hands Backpack Program, we aim to make this reality nonexistent. In order to do this we pack nutritious food in backpacks and distribute them to local school children enrolled in the National Free and Reduced Lunch Program. By doing this, we can help supplement the students’ meals over the weekend. In addition to making sure these students have full bellies, it has been proven that this program helps students achieve higher academic scores and that it reduces rates of absenteeism. If you have a few extra hours a week to spare, and want to get involved, we would love for you to join us! We are looking for team leaders and packers to help for 1-2 hours on Wednesday mornings. As part of our efforts to provide clothes to those who have none, we partner with various local shelters including Miami Rescue Mission and Hope South Florida to give provision to those who have the most need in this area. We also provide clothes to our missionary partners for them to distribute through their own compassion ministries. We are always in need of volunteers to sort and fold clothing that has been donated. We partner with 4KIDS of South Florida. Their mission is to provide homes with loving, Christian foster parents for children, who through no fault of their own, do not have a safe place to call home. 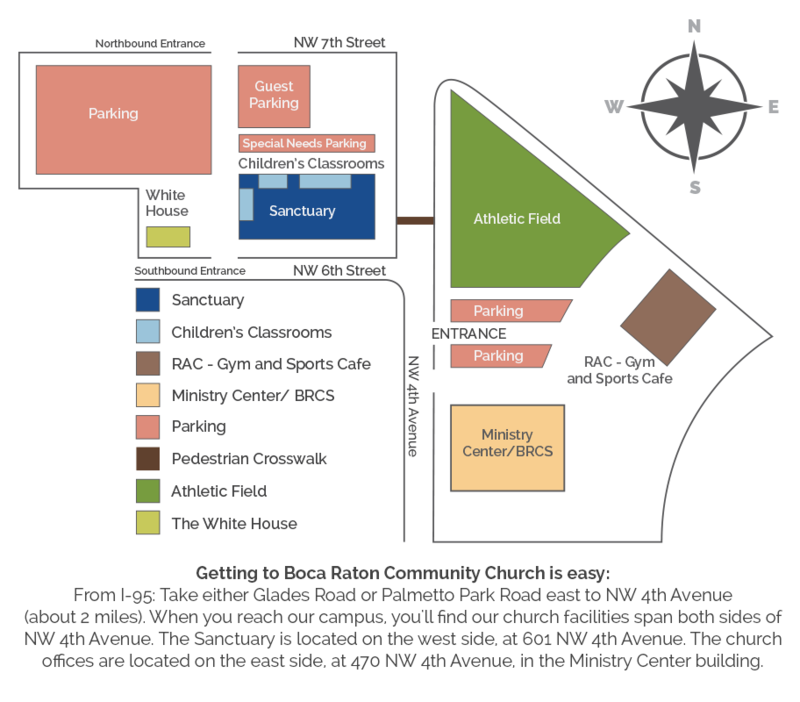 Boca Raton Community Church is proud to partner with such an outstanding organization to meet the needs of this special population.